The Rushis, that is, the sages, are at a level between the human beings and the deities. Detachment and spiritual knowledge is achieved through long-term sadhana. The person acquires the highest state of seekership. 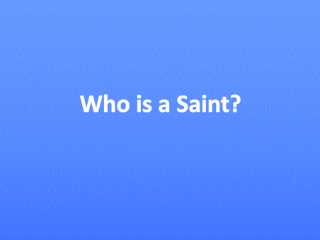 The persons who achieve this state are called sages. The sages are the adornment of Bharat and Hindu Dharma. The ancient sages had intense yearning to comprehend God. Due to this they conducted subtle research on the origin of the universe, its function etc. and established with evidence the meaning of deities, the Principles and their functions. 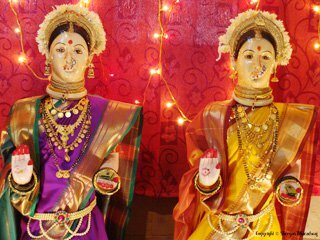 They showed with the help of their research that it is beneficial to invoke a specific deity to achieve a specific task successfully. The theories that science proves within its limited sphere and many other theories that are of subtler and superior level have been proved with evidence by the ancient sages thousands of years ago. Due to highly rigorous penance and intense longing for God-realisation, the sages obtained rare and infinite knowledge about Spirituality. The ancient sages had infinite love for the entire Creation. That is why they made available to the world the treasure of knowledge they obtained by the grace of God. 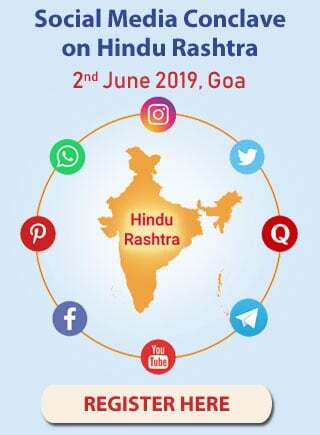 It is because of them alone that the information about the three gunas, various stotras, mantras, shloks and various kinds of penance and vrats are available to the world. The blessings of God and the resolve of the sages are inherent in the vrats. Hence the entire human race will always be benefitted by observing them. The sages have provided invaluable guidance on higher level sadhana to man through their conduct, thoughts and every action. It is due to this that it is possible for man to live in today’s Kaliyug. 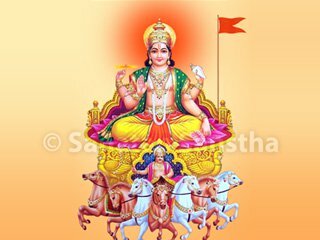 The sages (Rushis) are the symbol of spiritual knowledge and intellect and Gouri is the bestower of supernatural powers. 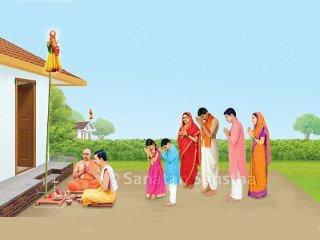 For this reason after the worship of Sri Ganesh, the worship of sages, that is, Rushipujan and the worship of Gouri, that is, Gouripujan are performed. 1. On the day of Rushipanchami after having a bath, the seven sages, Kashyap, Atri, Bharadwaj, Vishwamitra, Goutam, Jamadagni and Vasishtha along with Arundhati, are worshipped. 2. 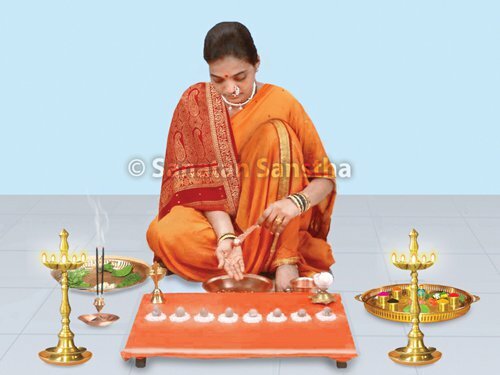 Eight heaps of rice are made on a wooden seat or low wooden stool and a betel nut is placed on each of heap as a symbol of the seven sages and Arundhati. 3. Before commencing the worship, to overcome the defects due to touching something consciously or unconsciously during menstruation, a resolve is made before the worship. 4. Thereafter the seven sages are worshipped along with Arundhati with sixteen substances. 6. After the worship, the betel nets which are the symbol of sages are immersed in flowing water. Meaning: Kashyap, Atri, Bharadwaj, Vishwamitra, Goutam, Jamadagni and Vasishtha are the seven sages. These sages are requested to accept my oblation of water and let me forever be graced by You. With this prayer to the sages the oblation of water is offered to them. 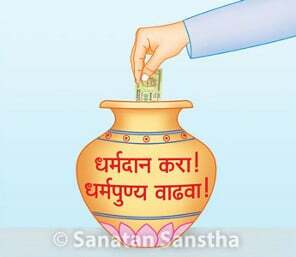 In this vrat, on the day of Rushipanchami the scriptures have prohibited consumption of grains produced by the toiling of oxen. This vrat is observed for 12 years. 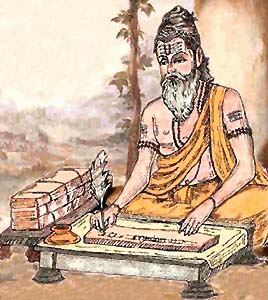 In ancient times, the sages lived a life totally devoid of any hoarding tendency (aparigrah). They did not accept anything obtained through the labour of others. It is important to consume roots on the day of Rushipanchami to remember their aparigrah attitude. During the monthly menses period, the proportion of raja guna increases in women, which adversely affects the person or the object touched by her. To remove this defect, women observe this vrat.